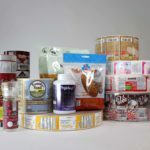 Axiom supports applications for durable label solutions that can withstand harsh environments using various materials including films, specialty laminations, metalized polyesters and other client specific requirements. 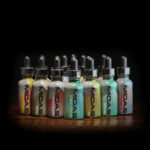 MOC, a large automotive product company, came to Axiom in need of a label for their brake fluid. MOC not only manufactures and packages brake fluid but also supplies their customers with a patented brake fluid exchanger allowing a single technician to perform a complete brake fluid exchange and bleed in less than ten minutes. For security reasons, the brake fluid exchange can only be completed when the technician uses their brake specific products. To ensure that the technicians are in fact using the required brake fluid the manufacturer created a system in which an access code, when typed in, confirms the authenticity of the product and allows it to be dispensed. Due to MOC’s specific and unique label requirements, the challenge was to create a consecutive number (up to 6 characters) on the outside of each label. This would act as the activation code necessary to authenticate and dispense the product. 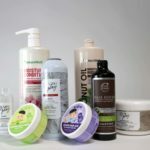 Axiom also had to address the need for this custom label to be printed so that it would adhere to a coated substrate and be resistant to the chemicals inside the product. 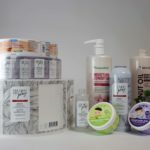 Axiom’s solution was to print and laminate a 10 color front label with a .001 clear proprietary self-wound laminate and finish using Ketan ink-jet technology to print the consecutive access code numbers. This process allows for the printing of up to 100,000 consecutive numbers directly on the label’s laminate during inspection. A small box was designed on the label to house the activation code numbers so that they could be viewed cleanly. 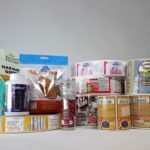 Measures were taken to ensure the numbers adhered to the label in such a way that no smudging or rubbing would take place during the high speed label application. 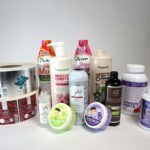 In this case, Axiom created a unique label solution that was the perfect combination of durability, critical numbering, and product resistance. 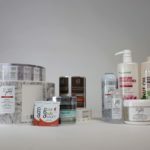 With a unique combination of flexo, UV, and digital capabilities and a wide array of specialty materials, Axiom has the knowledge, expertise, and ability to provide durable high fidelity products to meet specific applications.